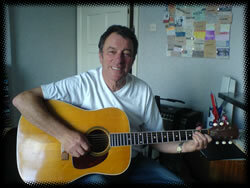 "This old buggar now aged 67 started playing guitar in the 50's. Started listening to jazz, mainly traditional from an early age, also blues played by artists such as Big Bill Broonzy, saw him in 1955 at the Hove town hall. Along with a group of friends formed a band, we played jazz we were self taught. Played regularly with a traditional jazz band until 1968 until family and business got in the way. Now in semi retirement still with my my Levin accoustic bought in 1960, decided to refresh knowledge and get some proper instruction on how to play - enjoying every minute and Andy has been great. My taste is very wide I like everything that moves me. Jazz: Django Reinhardt; Barney Kessell; Charlie Christian. In short if it makes me cry with sheer joy then I will listen." Began playing instrument In 1950's then a break for business from 1968 until 2006!